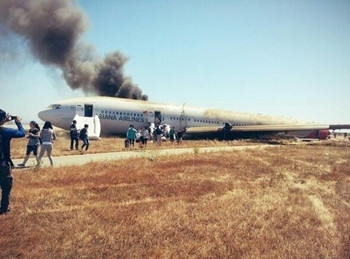 Investigators say the pilot at the controls of the jetliner that crashed at the San Francisco International Airport was only about halfway through his training on the Boeing 777. Defense attorneys in the George Zimmerman murder trial want to introduce text messages and a Facebook posting by Trayvon Martin about a fight he supposedly had with a friend. However, the judge has already ruled that Martin's interest in guns and fighting could not be used during the trial's opening statements. A South Korean delegation headed to the Kaesong industrial complex in North Korea on Wednesday for negotiations on restarting the jointly run facility. The complex was shut down in April as tensions rose between the two Koreas. Tropical storm Chantal roared south of Puerto Rico early Wednesday on a path that will see it pass over the Dominican Republic and Haiti. Authorities are warning of possible landslides and heavy flooding. Sandy Kozel, the Associated Press with AP News Minute.